Okay so My Little Pony is Awesome, and I know you agree, so here is where we can let our manes loose, discuss the show, (Try to avoid spoilers for the new bronies). 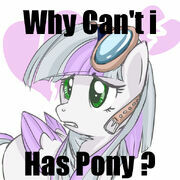 Also post the awesome images the ponies spawn. OMG I heart MLP! I actually started watching it on the telly with my little sister, so much better than the old show. I've never seen it. Don't even know what channel it's on. Poor Atnem, it's on Hub but that's a rare channel I use the Youtube. The youtubes. So good for so many things. I'm ashamed to say I've only watched a few of the episodes, but they were great fun. I also liked the old ones, but these new revamped ones are ultra fun, and quite entertaining. So who's excited for the new season? Me even though I technically haven't finished one yet...I am a bad brony. 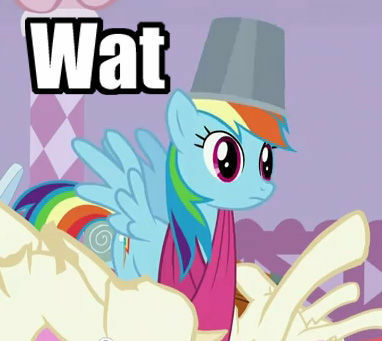 Ok srsly zee hell is all this about.... ponies your all very strange indeed. Youtube it fool. My Little Pony Friendship is Magic watch the first 3 episodes and tell me it's not amazing. Yeah it has to be the first three because the first one is kinda lameish...but onece the cutie mark crusaders come around there is no going back...Also I think fluttershy may have an anger disorder.